Microsoft Outlook Web Vs. Desktop: Which One Is Best for You? When people think of Microsoft Outlook, they think of their grandfather’s email client. But did you know there’s also a free online version of Outlook? There is, and today we’re going to compare the desktop and the online version head-to-head. The obvious difference between Outlook desktop and Outlook web is that the desktop version isn’t free – it comes as part of the Microsoft Office package, which isn’t cheap unless you’re a student or educator. How does the free Microsoft Outlook web version measure up against its paid desktop counterpart? Let’s have a closer look. What can you expect when you sign up for a free online Outlook account? As part of the Office online suite, Microsoft Outlook makes up the communications hub for your online productivity. You use Microsoft Outlook on the web just like you’d use your Gmail account. Outlook’s online email client also allows you to integrate multiple email accounts in one place, such as your live.com account, formerly known as Hotmail. Comparing the layout of Outlook.com to the Microsoft Outlook desktop application, the similarities between the two layouts become very clear. Account navigation, including all of the sub-folders, show up in the left pane, and the actual emails and email previews show up on the right. This is true for both online and desktop clients. When you click on the email in your Outlook.com account, you’ll see the preview off to the right. The same is the case with the desktop version, except that the desktop version has many more icons and features displayed in the top menu ribbon (which we’ll get to below). In both cases, you can also integrate with some of your favorite social accounts, but this is definitely not a strength in either case. With Outlook Online, you can connect with Twitter and LinkedIn, but account selection is very sparse, and the most popular social network Here Are the Fastest Growing Social Networks You Need to Join Here Are the Fastest Growing Social Networks You Need to Join While Facebook holds the lion's share of the social market, new services like Kik, Snapchat and WhatsApp threaten to break Facebook's stranglehold on the social Internet. Read More — Facebook — isn’t even available. The desktop is ever worse when it comes to social connections. On the desktop version, when I clicked on File, Account Settings and Social Network Accounts, I found myself whisked off to this web page, advising me that social account connections are “no longer supported”. At a time when use of social networks continues to grow, and lines continue to blur between messaging and social networking, it seems odd that Microsoft would go in the other direction and disconnect from these networks. Many people organize emails into folders, but another very effective organization tool that Microsoft Outlook provides is the ability to categorize emails, and color code them accordingly. This feature is available on the web version by selecting the email and clicking on the Categories item in the top menu. You can change any of the category names to something a bit more descriptive by clicking Manage Categories and then adding a new category. In the desktop version of Microsoft Outlook, categories are available as well. You’ll find them by either right clicking on the email and clicking on Categorized from the dropdown menu, or just selecting the email, clicking on the Home menu item, and choosing Categorize from the ribbon menu. Needless to say, when you are getting a huge volume of emails How to Send Large Files as Email Attachments: 8 Solutions How to Send Large Files as Email Attachments: 8 Solutions Want to send large files via email but running into file size limits? We show you how to send large files via email attachments. Read More , organization is really important and once you start using categories to sort things out, you’ll never believe you were able to get by without them. More powerful features you’ll find available on the free web version of Microsoft Outlook includes things like creating rules for incoming emails. You can get to this by clicking on the ellipsis in the top menu and then choosing Create rule… from the dropdown menu. Inbox rules available here include sorting incoming messages based on who sent it, who it was sent to, and words in the subject line. This is a very limited list, and so is the action list, which only lets you move, copy, or delete the message, pin or mark the message, or forward, redirect, or send. That’s it. The one bonus of using the Outlook web version is that you can set up automatic replies for whenever you’re out of the office How To Set Up An Email Out Of Office Responder In Outlook How To Set Up An Email Out Of Office Responder In Outlook What happens when you combine a two week vacation with a busy work life? You'll have a giant project when you return home: emails! Wait - why not automate some of it for you? Read More , during a specific time period. These are set up from the Settings menu, by selecting Automatic replies. Then, all you have to do is define the time period when you’ll be away and unable to answer emails, and you’re done. Microsoft Outlook desktop does include a Rules feature. In fact, it’s much more robust than the web version. When you click on Rules from the Home menu, you’ll see a window that looks very similar to the web version, where you can choose to trigger off of where the email is sent from or to, anything in the subject line, and so on. However, if you click the Advanced Options button, you’ll see many more trigger options — things like whether the email is marked as important, whether it has specific words in the body of the message, whether you’re cc’d or not, and so on. It’s worth noting that the desktop version does not provide for an automatic reply option, unless you’ve configured Outlook to work with an Exchange server. The one drawback of managing your mail on your local PC is that you can’t automate things that are typically server-based. There are a few things you can get with web Microsoft Outlook that you can’t get with the desktop version. Under settings, you’ll find a Manage add-ins option. These are apps you can “plug in” to your Outlook.com account to help enhance your online email client. This includes pretty cool integrations like Paypal, so you can more easily send money via email, Uber Ride reminders to your calendar, Evernote so you can easily save emails to your workbooks, and more. 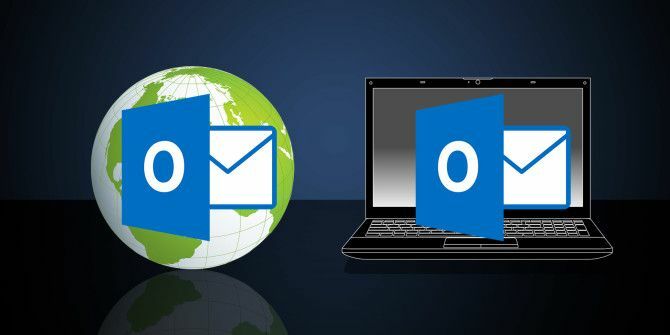 It’s also worth noting that while you can’t enable an out-of-office response in Microsoft Outlook desktop unless you’re connected to an Exchange server, you can set up an out-of-office email with your Outlook Online client, no matter what email service you’ve added. So, what can you do with the desktop version of Microsoft Outlook that you can’t do online? Quite a bit, actually. While your Microsoft Live account will include a task app and a calendar app, those aren’t quite as tightly integrated with your email client as they are in Microsoft Outlook desktop. Also, with the desktop client, you get a really powerful tool called AutoArchive, where you can have the client automatically file away your older emails, so that your inbox can stay nice and lean with little or no effort on your part. That alone is enough of a time-saver for many people to opt for using the desktop version of Microsoft Outlook, even though it isn’t free (Outlook Express, the free desktop version, is no longer available). Management of your inbox is also much easier, since you can sort emails by date, by sender or recipients, or flag messages for follow-up and quickly assign a due date for them. Of course, the most powerful part of the desktop version of Microsoft Outlook is the ability to customize it yourself, using the VBA developer that comes with Microsoft Office. You can enable this menu item in File > Options > Customize Ribbon and select Developer from the list of items from the list on the right. How do you decide whether to use Outlook Online or Outlook desktop? The answer is, it depends what’s most important to you. Is it important for you to have access to your email client from any computer and from any location? Do you prefer having better integration with online services and apps? If that describes you, then you’ll want to go with the online version of Outlook. Are you more interested in tightly integrated scheduling, task management, and organization of emails? Are you looking for a more robust set of rules you can use to automate the management of incoming emails? If this is you, then you’ll want to invest in the desktop version of Microsoft Outlook. No matter which version you choose, going with Microsoft Outlook gives you the peace of mind of knowing that you’re using a Microsoft product that is full-featured and constantly updated. And for more on Outlook, check out how to create an email signature in Office 365 How to Add an Email Signature in Microsoft Office 365 How to Add an Email Signature in Microsoft Office 365 Here's how you can add an email signature to the Microsoft Outlook Web App in Microsoft Office 365. Read More . Are you considering switching over to using Microsoft Outlook as your email client? Have you decided whether to use it online or on your desktop? Share your own opinions in the comments section below! Explore more about: Desktop Email Client, Microsoft Office Online, Microsoft Outlook. In all honestly the company is wasting more money by frustrating it's workers and having poor time management instead of paying the little bit per user for the additional features of the desktop version. I used to depend on Outlook but the technicians ahve ruined it and made it very difficult to use. It really is a hassle and the Oultook for my MAC system has poor performance, even though I pay a stupid subscription fee. And why do I have to create a separate Outlook online account when I already have the purchased system. Wouldn't you think they would link the two instead of forcing you to now create two new systems. Outlook also does a poor job of filtering out spam. Their services and options don't work. Outlook is a horrible experience. It is a horrible software program. It has very little benefits today and users should avoid it and find another way to access their emails so they can protect themselves against spam and email abuse. Just started with Outlook.com on Windows 7 desktop. So far, composed emails will not always send. There is no abundantly clear indication, unlike Yahoo Mail, that the email has been sent. Emails are - NOT - saved in the Sent Items folder, so there is no way of keeping a track of them. I also have Windows 10 on a laptop. Ugh! This one is getting consigned to trash. Notably poor software from a supposedly leading software giant. I have no complaints at all about Windows 7 however which is perfect in my estimation. Sorry to digress, but I think that these things need to be said. I like the article. As it made me lean towards using the version but only if it allows me to have a professional email address. I have an email of e.g. myname@mycompany.com. Can I configure the online version of Outlook to work with that email? If not, could I do it elsewhere i.e. with gmail or ? Absolutely terrible, time consuming and time wasting experience. Started with inability to import Contacts, resolved after 2 hour. Chat support session. Unfortunately sending emails resulted in recipient getting address field in hexadecimal, impossible to reply to. Another 2hr session resolved this. However now I can only get a subset of the Mail functions and sync inoperative - so can create emails but they don't go anywhere. Awful product, deficient and defective in my experience. I would just like to mention you don't have to choose, get both. I have an outlook.com account and I access this from within outlook (2016) via exchange server. Everything is synced between my Outlook.com email, calender and address book (people) and the Outlook desktop, so if at home I use Outlook but if on the move I can use Outlook.com. By the way my windows phone also syncs all these as well! Does this integration work the other way around? For example, I'm already using outlook desktop for business, but I'd like to use it on the go. Can I start an outlook.com account and integrate my desktop to it? Outlook 2013 screwed up my contacts. It pulled in all my old work contacts, and now I'm retired and its used for personal service. Auto complete doesn't work for names, only for email addresses. I used WLM 2009 for many years without a problem and was forced to change over to outlook by Microsoft. I have been trying to get all the bugs out now for more than a week. If you can help I would appreciate it. Still Using OUTLOOK2003 And GMAIL.COM Through POP3. If I Am In A Hurry I Check GMAIL.COM Directly. C - The Most Important One - I Can Treat All My Thousands Of Messages As A Database, With All Kinds Of Selections And Sorting. In my capacity as an IT guy, almost nothing infuriates me as much as desktop Outlook. It stores portions of its configuration in at least seven different places that I can think of, and any of those places can break. Users also like to mis-use it in all sorts of hilarious ways, not the least of which is using their inbox location as a de facto file server. I'll admit it's handy if you're operating in a pure Exchange environment with no customization allowed, but if you have to deal with "Why CAN'T my Google Calendar just sync with my work one?" or the user who accidentally subscribed to the RSS feed for the main page of MSN (thus getting a new message pop-up approximately every four seconds until someone fixes it) or the person whose entire productive life is kept in Outlook's "Notes" feature rather than some usable format like a Word document... at that point it's pretty easy why I want to condemn Outlook to the same fiery pit of hell as iOS and all Adobe products. There is useful information in this article, but the premise is wrong. Despite sharing Microsoft's common email branding, Outlook.com and Office Outlook are completely different; it's not really helpful to compare them as if they were somehow alternatives. Outlook.com is a free Web mail service, like Gmail, and it is used in exactly the same way. It's also how you are identified when using Microsoft's services: When you create a Microsoft account these days, you receive an "outlook.com" email address, not "live.com" or "hotmail.com". Office Outlook, on the other hand, is a full-featured desktop email client (emphasis on *client*). It requires an email service provider to do anything. It can be used with Gmail accounts just as easily as Outlook.com accounts. Most of Office Outlook's advanced features are designed for use with Microsoft Exchange-based corporate email systems, or with Office 365 business plans (which use hosted Exchange inboxes rather than Outlook.com accounts, as used with the consumer versions of Office 365). But you can use it as a desktop email client to Outlook.com, Gmail, or most any POP or IMAP-based email provider.